Hanging baskets for plants, flowers and herbs are an effective way to bring color, texture, fragrance and even flavoring to just the right place in your home, garden or patio. Hanging flower baskets don't have to be expensive to fill. 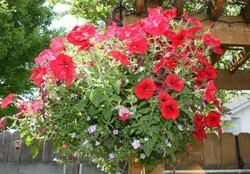 You can take some of the least expensive flowers like petunias and make extravagant hanging basket displays. As you'll see below there's a huge selection of hanging baskets to choose from. If you're a beginner gardener and feel overwhelmed at the prospect of a large flower bed, then a small hanging planter basket is just the right place to start. You can learn about a few flowers at a time. As your gardening confidence grows you can add more hanging baskets or move on to your front yard! Watch the YouTube video to the right and learn how Dan Hymes from the TerraNova Nursery designs perennial hanging planter baskets. If you've got a shady spot to fill on your porch or patio these perennials will thrive there. There's a begonia on the top which will provide beautiful foliage and large flowers. The bottom is filled in with heuchera, heucherella, brunnera, and trailing tiarella. If you live in a dry climate prone to droughts these are drought-resistent plants. As the seasons change the perennials leaves will turn different colors. Some will even produce flowers. Others like begonias will attract humming birds. Hyman recommends a time-release fertilizer to keep your plants thriving year-round. Flowers or Hanging Basket - Which Comes First? It just depends. Sometimes I'll be at a yard sale or shopping online and a hanging planter will just catch my eye. I'll love the material or the color. I buy it and then search for the perfect flowers to put in it. Sometimes I have a shady spot that I know will be perfect for a huge basket of impatiens, so I hunt for just the right hanging basket for the flower. I do love a bright white basket with clean lines like the one to the right. They bright color flowers pop. It's fun to match textures of different hanging baskets for plants. That way, even if you buy them all at the same time, your landscaping feels like you've been collecting pieces for years. Add a rustic vibe to your landscaping with the hanging planter shown to the right. It measures a generous 14 inches across and 13.5 inches deep. That's a lot of room to put in a variety of plants and give them room to create roots. This is such a beautiful basket that you'll want to space your cascading flowers to let some of the hanging planter peek through. The rust-resistant metal frame securely holds the coco liner, which retains moisture and warmth. Watch Kate from the Garden Squirrels make a beautiful hanging basket using two flats of yellow and purple pansies. She's using a metal frame basket with a material similar to coco lining. You can see just how much moisture it retains. At 12 inches across you'll have lots of room to plant a splash of color in the Gardman Pressed Metal Hanging Planter. I love the muted shades of green in the print. It reminds me of the leaves some of my variegated hostas. There's a special drainage feature in the bottom so you don't have to worry about root rot. The chain comes with it. I'd pile on the bright yellow annuals with a few green perennials. These little hanging flower pots are perfect for a small kitchen herb garden. Fill each of them with potting soil and a time-released fertilizer. You should find a fertilizer that lasts for about 3 months. Then put just 3 or 4 seeds of your favorite herbs in each one. I'd hang it in the window or at least a sunny part of the kitchen. Again from Kate one of my online gardening gurus from Garden Squirrel. This time she's showing us how to make a hanging planter filled with a beautiful begonia. 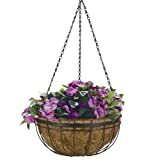 If your mother loves gardening and flowers and you don't know what to give her for Mother's Day or her birthday, then make her one of these beautiful hanging planter baskets. You'll be able to include the plants and colors she loves most. Learn how to easily attract crowds of butterflies to your yard and garden with the right perennial and annual flowers. You'll find a yard cart for every outdoor task. From heavy duty steel utility carts to light-weight folding canvas leaf carriers. Easy to buy and easy on the budget.